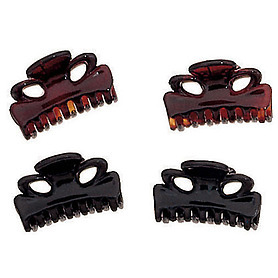 THe best hair clips for fine hair come in a number of different styles. You can choose from certain types of fine hair claws, jaw hair clips and others that will actually stay put in fine thin hair. Snap Clips: These are awesome hair accessories for most fine and thin hair, but not all. They are best used by themselves, if you have any kind of pretty pieces that are significant or weighty attached to them, they slip out. Size is key with these clips for fine hair; if you get them too big, they won’t work, too small and they can’t hold enough hair. Claw or Jaw Clips: These actually do work quite well…they stay in without making you pull your hair tight to your head librarian-style unless you want to. These are among the best accessories to hold both thin and fine hair in place. These standard clips work great, and are easy to find anywhere from the grocery store to department stores. There are other similar brands and styles that work just as well but may be little more “high end” for special occasions or events where a formal hairstyle is required. Try a stylish banana clip for fine hair – these work great for fine hair as long as they are small or lightweight, and some come in pretty styles. Beak clips can also be a great way to increase your fine hair style options, as they also come in different sizes, weights and style. A simple tortoise shell beak salon clip can actually go anywhere and look dressed up! For a really elegant touch, something like the Acanthe Golden Amber – Cubitas Bellini Collection is perfect for weddings or formal event.